The LECTRAY 3 IN 1 is a most innovative and versatile product developed for professional chapel, mausoleum or graveside services. These 3-piece unit can be used complete or separated into individual components as needed. 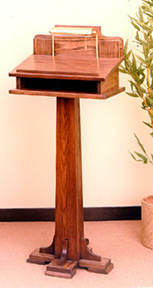 Use the lectern as a convenient guest register (B). Or, with the addition of the tray (A). Or convert into an unobtrusive stand for use only as a committal tray (C). 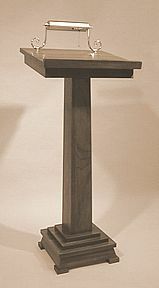 And because the stand includes non-skid, non-marking rubber "feet" and detachable ground stakes, this lectern may be use in confidence indoors or outdoors. Solid Oak, Walnut or Cherry. Comes with card pockets for large service holders. Comes with light. Great when you need something portable yet professional looking! 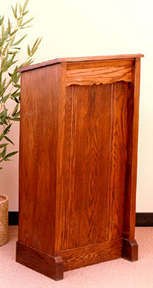 This dual purpose unit serves as a lectern or pulpit. All wood. 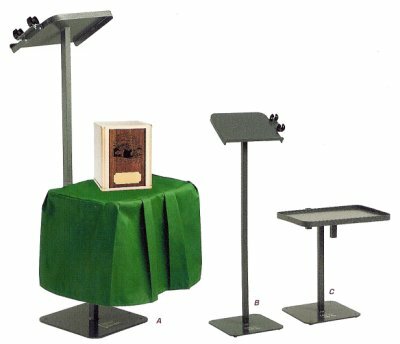 Light for lectern is available . 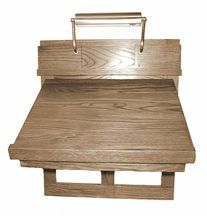 Superbly constructed in solid Oak or Cherry. single pedastal with card pockets for large service holders. Comes with light. Medium dark finish, rubbed hard to furniture finish. Comes with metal light fixture. 41" desk height; 48-1/2" overall. Feather light aluminum, gold anodized with mar-proof mahogony writing surface. tripod base. 8 lbs.